Inspired by the multi-function leads used to train guide dogs, Katrina Boldry, the founder of Bold Lead Designs, has designed a versatile, durable leash for all of your dog walking and training needs. Handcrafted in the USA, the 8-Way Lead is a leather leash that can be configured 8 different ways. Clip it to a collar or harness for everyday use. Or, use it as a slip collar for effective, yet gentle training. It can be shortened for keeping your dog on task or lengthened for playtime. 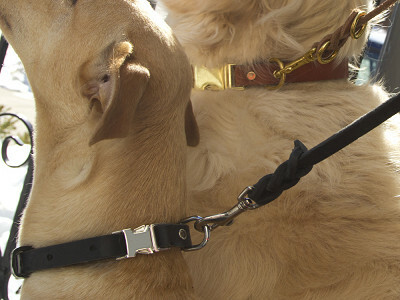 The 8-Way Lead can even be used as a hands-free leash by placing it over your shoulders. For dual control, connect one end of the leash to a training collar, and one to the regular collar. Top quality hardware, American craftsmanship, and a multi-functional design make this lead the only one you’ll ever need. The same high-quality leather and beveled edges that make the 8-Way Lead a pleasure to hold can also be found in Bold Designs Traditional Lead and Quick Release Collar. But don’t let the softness fool you. These dog solutions are built to last a lifetime—literally. Each one comes with a lifetime warranty. Inspired by the multi-function leads used to train guide dogs, Katrina Boldry, the founder of Bold Lead Designs, has designed a versatile, durable leash for all of your dog walking and training needs. Handcrafted in the USA, the 8-Way Lead is a leather leash that can be configured 8 different ways. Clip it to a collar or harness for everyday use. Or, use it as a slip collar for effective, yet gentle training. It can be shortened for keeping your dog on task or lengthened for playtime. 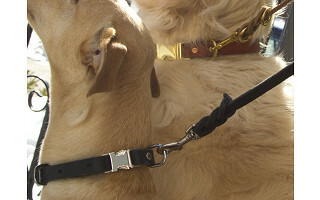 The 8-Way Lead can even be used as a hands-free leash by placing it over your shoulders. For dual control, connect one end of the leash to a training collar, and one to the regular collar. Top quality hardware, American craftsmanship, and a multi-functional design make this lead the only one you’ll ever need.